Our oven thermometers range from traditional dial meat thermometers to digital thermometers. It is recommended, that in order to destroy harmful bacteria that can cause food poisoning, food is cooked to 75°C through to the centre. 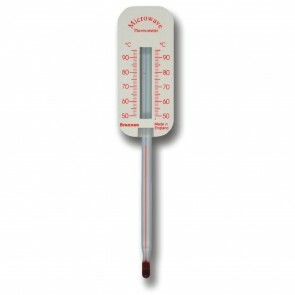 Thermometer Superstore offers a selection of thermometers for ensuring that food is cooked to safe temperatures. A meat thermometer should be inserted into the joint being cooked until its tip is in the middle of the meat. The dial will show the temperature the meat has reached at the centre of the joint which is likely to be lower than the meat's surface temperature. Most meat thermometers are bimetal stip dial thermometers. The advantages of the dial thermometer are that it is simple, easy to use, reliable and relatively cheap to buy. However there are an increasing number of digital oven thermometers now available which offer additional features at an affordable cost. The way a digital thermometer works is that the sensor is placed into the food being cooked and then the oven door is closed over the sensors cable. The cable is made from a special material that is designed to withstand high temperatures. The thermometer itself is positioned outside the oven. The chief advantage of the digital oven thermometer is that the food temperature can be monitored without opening the oven. Digital thermometers also have additional features depending upon the model. These include alarms to warn when the food has reached a pre-set temperature and cooking timers. We also sell spirit oven thermometers that can be used to measure the air temperature in the oven. This is useful to ensure that food is cooked at the recommended temperatures or to check the accuracy of an oven's built in thermometer and thermostat. A frying thermometer is similar to a dial meat thermometer but has a greater temperature range to cope with the higher temperatures that fried food is like to reach. Also in our range is a thermometer specially designed for microwave use. The microwave thermometer is spirit filled with a clear display to help the user ensure food is cooked properly.